As Flint’s water crisis continues to escalate, PURINIZE made an emergency visit to Flint, Michigan to test the water quality, assess the contamination issues, and offer their support to the community. Ultimately, we would like to help Flint with a large-scale solution for the treatment of the City’s municipal water. The crisis began when City officials made a decision to save money by switching from Detroit's water system to that of the Flint River. The river water, which was not properly treated, eroded old pipes and caused lead-tainted water to be distributed throughout the city. The crisis, now under criminal investigation by state and federal authorities, caused elevated lead levels in the blood of thousands of Flint citizens. To fully understand the scope of Flint’s water contamination, Patrick Rascon, PURINIZE Vice President of Sales, visited the City and gathered water samples right from the source. These water samples were collected from five customer water sources connected to the Flint public water system including a barber shop, automotive salvage yard, and several private residences. The Flint tap water samples have since been sent to Envirotek Laboratory, in Mullica Hill, New Jersey, for testing. PURINIZE—designed to reduce over 200 toxic contaminants including agricultural and industrial chemicals, pharmaceuticals, disinfectants, disinfection byproducts, and heavy metals—has already been proven to reduce the concentration of lead below the detection limit, as set by EPA Method 200.0, however the testing of Flint’s water will provide exact data on how the PURINIZE acts in this specific case. Also during Rascon’s visit, he met with Pastor Bobby Jackson of The Hope for Flint Mission (hope4flint.org) to talk about the impacts the crisis is having on the community and how PURINIZE can help. He left Jackson with PURINIZE and water filters to help until Rascon returns with the test results. To produce safe drinking water at home, Flint residents are encouraged to add the PURINIZE Water Purifier solution to the city tap water in the suggested amount per volume. After 60 minutes, the water is ready for drinking. It is also recommended that the treated water be filtered through a PURINIZE portable water filter as well. 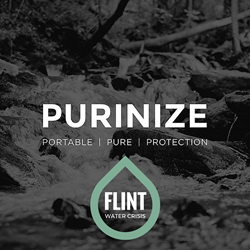 In an effort to relieve Flint residents of some of the financial burden caused by the water crisis, PURINIZE is offering a 50 percent discount to Flint residents towards water purification products at http://www.purinize.com when using the code FLINT50 during checkout. PURINIZE is a company made up of like-minded individuals dedicated to providing affordable and effective solutions for the world's rapidly growing water crisis. The company's mission is to develop water purification products for human water consumption that also cause no harm to the environment. For more information, visit http://www.purinize.com.